Players get to experience firsthand the dream world where Snoopy is a famous World War I flying ace. The gameplay is similar to that of another arcade-style flight combat series Crimson Skies. On the downside, some of the landscapes and environments are a little bland and blocky, with not a lot of variety, although given the stylistic presentation, this may be on purpose. All you need to do here is attack the boss's weak points and dodge its attacks. Other times, you are in control of Snoopy's feathered friend, Woodstock, who is being pulled in a small glider behind the Sopwith Camel. I do wish that more voiceover was used during the missions. Some might dislike the fact that the characters are all rendered in 3D during the cinematics instead of traditional 2D animation or at least with cel-shading. The skies are usually littered with enemy planes, and more appear to replace the ones you shoot down, so there's always something to shoot at. Woodstock acts as a gunner, blasting away at the boss. You needn't worry about steering here, as Snoopy flies around on a predetermined course. Both of these types of battles add a little variety to the gameplay. In between levels, Snoopy returns to the hub world, which is on the Peanuts baseball diamond. Here, you can get some flight training from Marcie or visit Pigpen's shop to purchase upgrades with coins that you collect in each stage. The upgrades include added health, firepower, and "stunt power. You can also buy new secondary weapons that add to your arsenal. One annoying factor I noticed is that some levels require a specific secondary weapon to complete. Unfortunately, you don't learn this until you're about to start the stage. More than once, I was forced to replay old levels just to earn more money because I had just spent all my coins on upgrading my Camel, unaware that I needed to save some cash for the new weapons. 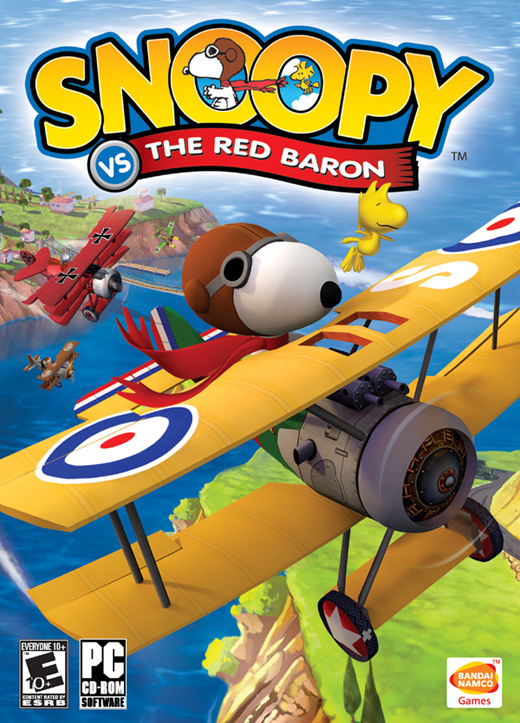 This game is set within one of Snoopy's dreams, where his doghouse becomes the imagined Sopwith Camel biplane, and the neighbor kids become military allies in a fantasy version of WWI-era Europe. Campaign mode is the game's main story mode, and it begins with a cinema scene setting up the story. These scenes go a long way in making the game feel like a Peanuts special. The Vince Guaraldi-esque music mixed with the somewhat stilted dialogue reading from the child voice actors lends an authentic feel to the proceedings. Some might dislike the fact that the characters are all rendered in 3D during the cinematics instead of traditional 2D animation or at least with cel-shading. There are also a few clipping issues and sometimes objects phase in and out, although the game runs smooth enough, thankfully. When Snoopy sits up and makes rat-a-tat noises, Charlie Brown suggests that he was probably dreaming about being a famous World War I flying ace. As I mentioned before, some of the targets range from mainly aerial types, but also can run the gamut of submarines, anti-aircraft guns and more. Personally, I kind of dig the fact that the cinematics look like a living version of the old Peanuts View-Master reels from the late '60s. I doubt this is what the developers had in mind, but I'll chalk it up to happy coincidence. A Real Dog Fight The game itself is a flight combat game. The Red Baron takes you across several missions across six main locales as you battle in the quasi-historical World War I sky. While you're flying, other buttons let you kick in the turbo or air brakes or perform evasive maneuvers, like a roll, loop, or Immelman turn. Sadly, they only support two players, and there's no online play. Given that it's targeted at younger players, it's less of a sim and more arcadey. Think of it along the lines of Crimson SkiesJr. During most of the game's stages, you can fly wherever you want, shooting down enemy planes and other targets. As you progress through each mission, you'll constantly be updated with new objectives that you'll have to accomplish in order to emerge victorious.